The Surveying and Mapping Division provides project and geodetic surveying services to various County programs and departments. Project surveying includes boundary surveys, topographical surveys, right-of-way surveys, as-built surveys, construction stake-out, and sketches and descriptions of County owned property. 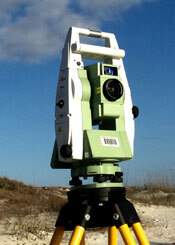 They are also responsible for surveying for future acquisitions and easements. 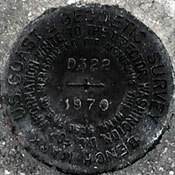 Geodetic surveying includes providing the County Geographic Information Systems (GIS) Division with geodetic control for the base map layer of the GIS. The Surveying and Mapping Division responds to questions from other professionals and the general public on a wide range of GIS and surveying topics. They review subdivision plats prepared by consultants and private surveyors to ensure compliance with applicable laws and standards. 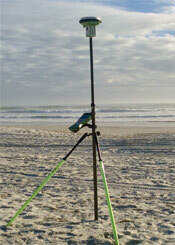 They develop and maintain the local repository of land survey information. Survey Records of County roads and County owned property are open to the public. To review this information please phone (904) 209-0760. Please note: St. Johns County Surveying and Mapping only surveys County owned property. We do not survey or have copies of surveys of privately owned land. For a copy of your survey, contact the surveyor, title company, or attorney that handled your closing. For more information, visit our FAQs page. St. Johns County maintains Benchmarks throughout the County. These Benchmarks are based on closed level runs between published Benchmarks. It is suggested you search for a published Benchmark at www.labins.org prior to contacting St. Johns County as many times there are more Benchmarks available on the Labins website than there are in the County’s database. If there is not a published Benchmark on the Labins web site near your project, then please visit our County Benchmark Database. Included on this site are published NGS Benchmarks with links to the NGS Database. If you need further assistance with Benchmarks please contact: Scott Lane. The County’s Benchmarks are also available in .kmz format for download and use in Google Earth. To download the .kmz file, from our FTP site. This file is update monthly. St. Johns County has three CORS stations covering the County offering single baselines solutions. We also stream raw data to FDOT for the Florida Permanent Reference Network (FPRN). For additional information please contact Scott Lane at (904) 209-0766 or email him at slane@sjcfl.us with any questions. FTP Downloads contains various right of way maps, unrecorded plats, historical property accessor maps, the old “city” plats, our County Road Plat Map Books where maintenance maps are record, and other various historical maps and documents. If you do not find what you are looking for please contact Chuck Riley at (904) 209-0768 or email him at criley@sjcfl.us. Flood Zone information can be obtained from our Development Services Division. Please visit our Flood Facts page, for additional information. St. Johns County's Digital Plat Submittal Requirement.